Shop Good - Do Good: Greenheart - with discount code!! So much so that today I decided to take up a knitting lesson at work! Okay, before you get all huffy that I should be using company time wisely, blah, blah, blah on me – I need you to understand that I just worked 25-ish hours in 2 days, took lunch at my desk all week (usually while working), and had my work done for the day. I am working on knitting an infinity scarf. 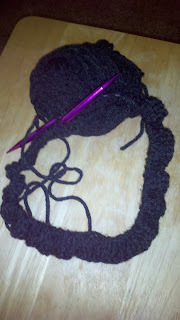 It is coming along and I am finally getting a rhythm down with it, but I’m sure that will come with practice. I was definitely being laughed at by 2 ladies who were working with me though – yes, it took 2 people to help me get this going. It sure doesn’t look that hard when they knit! My mom has always been crafty – like since I can remember. She had knitted each of us a blanket when we were young. Mine was pink and white. And unfortunately I don’t think I have it, but I would love to be wrong about that. She has also done a lot of cross-stitching over the years. My all-time favorite project of hers has to be the Christmas stockings that she made for us. The detail and amount of work that she put into making all of those tiny stitches is amazing. Want to hear something great?! Greenheart was nice enough to offer the Shop Good – Do Good readers a discount code for 20% off of your purchases through February 20th, 2012. To get your discount just enter ShopGoodDoGood at checkout. This is a place that really has such a wide selection of things that I have a difficult time doing it justice so please, please go to their site to see everything they have. It's a great place to look for gifts for any occasion.